1. Cook pasta according to package, drain and set aside. * To make this using just one pot, use a dutch oven! 2. Using your dutch oven or a cast iron skillet, brown meat. When done, drain any fat. 3. Add your cooked pasta to the drained meat. (If you don't have a dutch oven or cast iron skillet, you can move everything to a casserole dish.) Then layer with meat. 4. Next sprinkle the seasoning packet over the meat then pour water over top. Next add salsa. 5. Give everything a stir to mix ingredients together then top with shredded cheese. 6. Bake in the oven at 400˚ for about 18-22 minutes or until cheese is melted and sauce is bubbly. 7. Serve with any taco-style toppings you'd like. See above post for ideas! 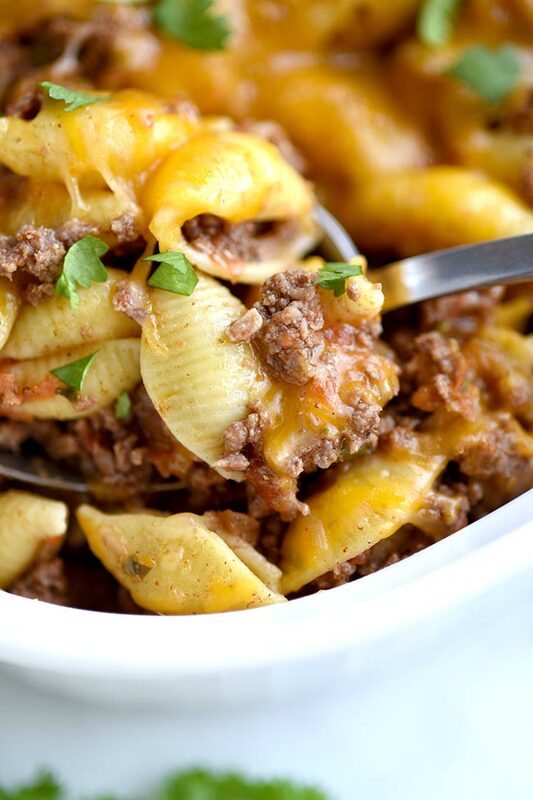 This 5-ingredient, cheesy taco pasta casserole is one of those tried and true recipes you can doctor up according to what you have on hand or enjoy it as an easy weeknight dinner without all the extras. It’s great in it’s basic form, but it’s also really versatile. I’m going to show you how to make this taco pasta casserole in it’s most basic form and then give you some ideas for ways to change it up — make it healthier, fancier, and even yummier. How many people will this taco pasta casserole feed? This is a BIG casserole. It will feed about 8 people good-sized portions. So this is a great recipe for feeding a crowd say, if you’re hosting a party or a large family dinner. However if you have an average sized family, then you could split this recipe in half. Or go ahead and make this recipe but divide it into two casserole dishes and freeze one for later. What kind of toppings go well on this taco pasta baked? Alright, so now that you have a good idea of how much this makes. Let’s talk about substitutions and toppings. I’m just going to list out some of the ways you can change up this basic casserole to make it into a completely customized dish, but the prep is basically the same. Try topping this taco pasta with shredded lettuce or other leafy greens, diced tomatoes, sour cream, olives, onions, fresh salsa, pico de gallo, guacamole, corn, beans, sauteed peppers, lime juice, cilantro and/or pickled jalepeños. Anything you’d put on a taco works!! Try using different shaped pasta to change the texture. Experiment and find what you like best. I used shells but you could use elbow macaroni, rotini or even spaghetti noodles! Heck, you could even try using rice. Try different cheeses. You could use a blend of cheese, Cotija (a crumbly Mexican cheese), melty queso, etc. Try different salsas. I really love fresh or restaurant style salsa but you may love chunky or salsa verde. Any salsa works! You could even make your own salsa. Like a little heat? Spice it up some with a few dashes of hot sauce, chili powder and/or some cayenne pepper. Add some extras into the bake itself. For example, corn, beans, peppers, green chilies, etc. would all mix into the sauce pretty well vs. using them as toppings. You don’t actually have to bake this taco pasta. Try making it in a skillet. The cheese should melt enough when you sprinkle it on top and if not. Who cares? It’s still good with cold cheese just like a taco is. So if you’re short on time. Don’t worry. This recipe is truly no-fail. Do you have to serve this taco pasta casserole with toppings? Nope! It’s good just by itself. That’s really the beauty of this time-saving dish. 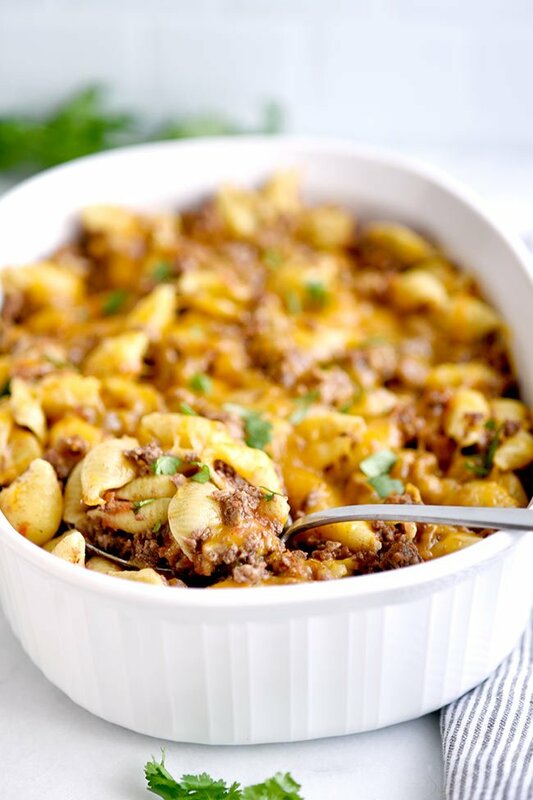 It’s delicious on its own as an easy Hamburger Helper style dish. Or you can really jazz it up if you have time to run to the store and get extras… or maybe you happen to have a few things on hand that would work well as toppings. Great! Throw in what you have and don’t worry about it. It’s one of those easy dinner ideas you can keep in your back pocket. So when you’ve had a long day and you don’t want to stress about dinner. Pull this out of your bag of tricks. This can be made using just one pot if you have a dutch oven. Use it to cook the pasta then after you drain the pasta, use it as your casserole dish. You could also use a large cast iron skillet. It’s just a little harder and potentially messier to boil pasta in a cast iron skillet since the sides are low. 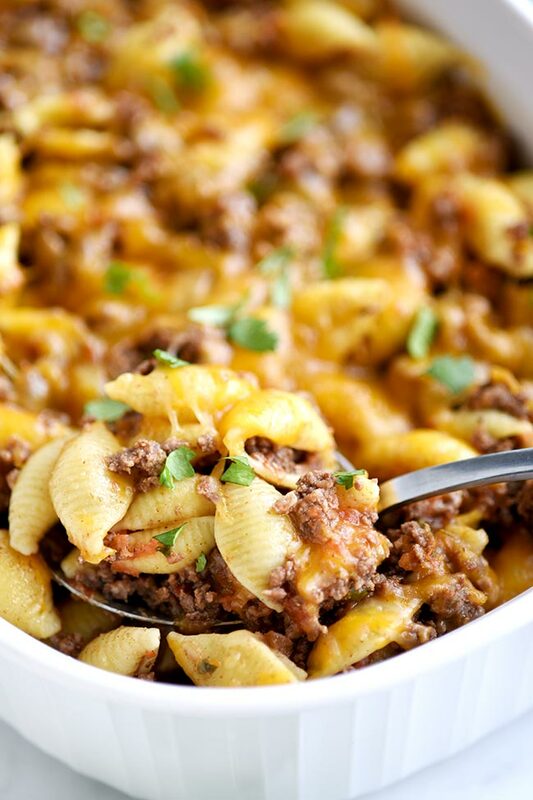 This taco pasta casserole was featured on Full Plate Thursday and Made by You Monday and Thursday Favorite Things! For more easy weeknight meal ideas, check out my meatza pie and other easy dinner recipes.